This morning, US2020 announced the winners of the third annual US2020 STEM Mentoring Awards. The awards are a national platform to celebrate and encourage exceptional work in science, technology, engineering and math (STEM) mentoring. Awards were handed out at the Ronald Reagan Building and International Trade Center, where national leaders in this field are discussing strategies for advancing STEM opportunity in the United States. As summer’s blaze softens into autumn hues, our city’s children are back in the schoolhouse. For many students in the Boston Public Schools, summer was more productive, inspirational and fun than they expected. This is thanks to citywide work to replace traditional summer school with creative and research-based summer learning, as well as a growing commitment in Boston to ensure all students, regardless of family income, access a wide range of summer activities. Have you heard anything about DACA and/or DAPA? DACA stands for Deferred Action for Childhood Arrivals, DACA is an American immigration policy founded by the Obama administration in June 2012. Deferred Action for Parents of Americans and Lawful Permanent Residents sometimes called Deferred Action for Parental Accountability, is a planned American immigration policy to grant deferred action status to certain undocumented immigrants. DAPA and DACA give immigrants opportunities such as employment, but there are some downsides to DACA and DAPA that affect many immigrants. DACA and DAPA programs do too little to protect undocumented immigrants while allowing them to legally stay in the US because their rights can be easily taken away and they don’t know if they can get citizenship. But others, like Republicans think that immigrants get too much support because there is too much spent on the immigrants. Before Sydney Chaffee was Teacher of the Year, and before she began working at Codman Academy, she was an 8GA Teaching Fellow at Citizen Schools Massachusetts. In this video she prepared for our 2017 WOWNOW Gala, Sydney shares stories from her time as a TF and what she learned from serving with Citizen Schools. Nativity Preparatory School in New Bedford, Mass., could lose vital funding for most of its teachers if the AmeriCorps program is slashed from the federal budget. But such a threat also exposes the challenge of providing a tuition-free, private school education for students from low-income families. In the past year, our programming has continued to demonstrate measurable impact in academic growth and achievement, helping to narrow the opportunity gap in our schools. This report includes key national and regional results, as well as introductions to just a few of the many supporters, volunteers and Americorps members who help make it possible for middle schoolers across the country to discover and achieve their dreams. Leaders of several hundred education nonprofits, charter school networks, and other education groups have signed onto an open letter expressing “unequivocal disagreement” with the travel ban President Trump instituted last month. Winter marks a set of important anniversaries for Citizen Schools: the anniversary of our incorporation on Martin Luther King Jr. Day in 1995; the anniversary of Black History Month, which offers the country an important reminder of the perseverance and resilience necessary to forge a more just and equitable society; and, now, my first year anniversary as our CEO. I am proud to stand on the shoulders of giants in fulfilling our mission to close opportunity gaps to restore economic mobility in this country - and every student’s shot at the American Dream. Since our earliest days at Citizen Schools, we have invested in rigorous external evaluation to understand the impact of our program on students, school communities, and Citizen Schools volunteers, and to identify the priority areas for improvement. Today marks an important milestone in this commitment. We are pleased to release the final report of a five-year external evaluation of the Citizen Schools national Expanded Learning Time (ELT) initiative, conducted by Abt Associates. CHICAGO, IL - October 20, 2016 - The Learning Assembly, a national network of education organizations that help educators rigorously implement and assess innovative tools to support teaching and learning, today released the results of a national survey of K-12 public school parents designed to gauge their perceptions of technology use in school. According to the survey, parents see a growing role of technology in schools, with 66% of parents indicating that technology use has increased over the past few years. The survey also shows that while 93% of parents believe in the use of technology to tailor student learning, only 1 in 3 believe that schools are currently doing an excellent job using technology for this purpose. "Parents don't see technology as a silver bullet, but the data suggests that they do see a link between smart implementation of technology and the kind of tailored, personalized education that they want and expect for their children," said Phyllis Lockett, CEO of LEAP Innovations, a Learning Assembly member working with Chicago schools to personalize learning. "It's absolutely critical that we provide teachers and schools with the training and supports to use technology effectively to create meaningful, personalized learning experiences for every child." The Learning Assembly, supported by the Bill & Melinda Gates Foundation, is a network of seven nonprofit organizations Citizen Schools, Digital Promise, Highlander Institute, iZone, LearnLaunch, LEAP Innovations and the Silicon Valley Education Foundation working with schools across the country to improve learning outcomes by applying and testing new tools and strategies in the classroom. The poll's findings reflect a shift, in recent years, from a focus on access to technology in the classroom to the purposeful implementation of technology that can help educators to better engage students, differentiate instruction, and improve student learning. Parent views on technology, according to the survey, appear to vary based on the perceived quality of implementation. Parents who report their children's schools are doing an "excellent" job using technology to tailor learning are two and a half times more likely to report that their children learn more and that their children are more engaged than parents who report their schools are doing a "fair" or "poor" job. 41% of parents say digital communication is the most frequent way they communicate with teachers (including email, text, and digital applications). 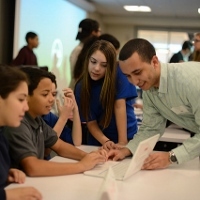 Last school year, Learning Assembly member organizations partnered with 101 schools and 368 teachers serving 13,400 students to pilot and evaluate education technologies and innovative teaching strategies in cities including Chicago, New York City, and the San Francisco Bay Area. These organizations help schools select the right learning tools to support their goals, provide training and support for educators, and identify which approaches are improving outcomes for students. "Parents want their child to have a personalized learning experience, and believe technology can play a supporting role in the classroom," said Emily McCann, CEO of Citizen Schools, a nonprofit that works with middle schools in six states across the country to close the opportunity gap. "These findings demonstrate the importance of our organizations' collective mission to help schools build the capacity to wisely choose, deploy, and evaluate innovative tools and strategies in the classroom." The poll was conducted by YouGov September 9 - 16, 2016 with a sample of 1,000 parents with kids in public schools and margin of error of +/- 3.8%. Raise the bar for quality in the edtech market by analyzing and sharing evidence of learning outcomes. The Every Student Succeeds Act (ESSA), signed into law by President Obama on December 10, 2015, keeps important accountability components, such as disaggregating and reporting data on student subgroups, but does away with one-size-fits-all federal requirements. Overall, ESSA calls on states, districts, and schools to offer ALL students a well-rounded education through increased flexibility over accountability systems and funding, and provides an opportunity for deeper engagement with families and community-based organizations. We are calling state education leaders into action to leverage the flexibility in ESSA to call for innovation and alignment of our education system to a 21st Century global economy by expanding learning time, making learning more relevant, and involving citizens and residents of this country in the shared enterprise of education. Only by critically rethinking and boldly re-imagining the basic structures of education, can we advance our educational system and develop a workforce that is prepared to meet the challenges of the global age. In 2015, we formed the Expanded Learning Middle School initiative along with 19 other national, state, and local groups committed to education and child and youth development, with a particular focus on expanding learning opportunities through creative school designs and out-of-school-time programs. Collectively, we represent thousands of educators, parents, children, private-sector donors, volunteers, and community-based advocates. We firmly believe that all students—regardless of income or background—need access to high-quality, real-world learning opportunities and mentorship that will help put them on a path to success. We are proud that our partnerships with schools, companies, and national service programs are contributing to student learning in unique and effective ways, which will have long-term impacts on students’ life trajectories and contributions to society. Students we serve have rapidly increased their learning and academic growth during their elementary and middle school years, entered high school more prepared for success, and enrolled in college at rates higher than their peers. Moreover, the staff from Citizen Schools and many of the other organizations have enjoyed careers as teachers, school and district leaders, researchers and policymakers. Core to our beliefs is that all children need to be inspired through their education and surroundings to develop the necessary academic and social and emotional skills—such as growth mindset, resilience, and self-management— to be college and career ready. Yet income and background often limit access, especially to high-quality programs. For instance, upper-income families have tripled their investment in their children’s education in a generation—amounting to a gap of 6,000 hours of extra learning by 6th grade. Lower-income children count on public schools, even though most students only spend 20% of their waking hours in the classroom. To shift this trend, schools and community organizations like ours across the country are collaborating to expand learning opportunities for low-income students, with a special focus on the critical, but often neglected, middle school years. Studies show that expanding time and opportunities for student learning has an impact on student achievement—particularly for at-risk students. By expanding the learning day and creating summer learning opportunities, more students can have access to academic support, enrichment activities, and mentoring. Recent research has also found that afterschool programs contribute significantly to the development of skills required to thrive in the 21st century, like problem solving, communication, and teamwork. These skills, such as leadership, effective communication, and teamwork, are essential to supporting college and career readiness among students and ensuring they are prepared for life. Please see appendix for resources on evidence of the impact of expanded learning time (ELT). Congress included ELT in several sections of ESSA. This is a milestone for our students and school communities, as the new law represents the biggest commitment the federal government has made to ELT. ESSA sets conditions that will help schools and community partners sustain and grow expanded learning opportunities around the country. As state education departments begin their ESSA state planning, we ask that they engage a diverse group of community partners on the front end of your planning process. We believe that state and local leaders are best served by designing a process that includes community stakeholders—such as educators, parents/families, young people, local government, community-based organizations, higher education institutions, philanthropy, private sector, faith-based institutions—that offer assets and expertise that can support the education of our young people. Below is a list of programs and provisions in ESSA that different states can leverage to grow and sustain expanded learning. For any questions, please contact Roxanne Garza at roxannegarza@citizenschools.org. Boston, MA—February 29, 2016— National non-profit Citizen Schools, as part of its participation in the Expanded Learning Middle School Initiative, is calling on all candidates for President of the United States to adopt a policy platform which helps reduce the opportunity gap that exists in low-income, urban schools where students receive 6,000 fewer instructional hours than their more affluent counterparts. “Upper-income families have tripled their investment in their children’s education in a generation—amounting to a gap of 6,000 hours of extra learning by 6th grade. Lower-income children count on public schools, even though most students only spend 20 percent of their waking hours in the classroom. We want to expand learning opportunities for low-income students, with a special focus on the critical, but often neglected, middle school years,” said Emily McCann, CEO of Citizen Schools. Leverage human capital: Hiring teachers costs money that many districts simply don’t have. This is why school systems need to examine designs which utilize community partnerships with non-profits like Citizen Schools, businesses, and national service programs like AmeriCorps and VISTA, which offer expanded learning opportunities at minimal cost to the district. Focus on middle school: These are critical years for a child and a time when they need to be more fully engaged and shown a path to success in high school and beyond. Encourage public-private partnerships to grow high-quality expanded learning and mentorship opportunities, with a particular focus in the STEM fields. Support investing in what works: Commit to continuous improvement programs to ensure that the money which is invested in education can provide for the greatest outcomes for all children. The letter is endorsed by eleven regional and national non-profit organizations that serve hundreds of thousands of middle school students across the nation. These organizations have come together to ensure these important education issues are part of the public policy debate. FOR IMMEDIATE RELEASE BOSTON, Mass—December 9, 2015— Citizen Schools, which partners with public schools to provide academic support and hands-on learning for middle school students in high-need communities in seven states, applauds U.S. Senator Elizabeth Warren (D-MA) for her efforts to pass the Every Student Succeeds Act, which rewrites No Child Left Behind. The legislation, approved by the Senate Wednesday, provides a new opportunity to improve education in America through greater adoption of expanded learning time in public schools, says Steven M. Rothstein, chief executive of Citizen Schools. The Act passed the U.S. House of Representatives on December 2, 2015, with strong bipartisan support. President Obama is expected to sign the bill into law before the end of the year. Senator Warren sits on the Senate Health, Education, Pensions, and Labor Committee and played a key role in supporting expanded learning time throughout the process. "This is the biggest commitment the federal government has ever made to expanded learning time. This is a historic milestone for underserved students and a strong statement from a bipartisan group of legislators. It will be an important step to reduce the opportunity gap that has grown over the years,” said Rothstein. Citizen Schools commends the U.S. Congress for producing legislation that keeps important accountability components for closing the achievement and opportunity gap for low-income and historically underrepresented students, but does away with one-size fits-all federal requirements. In particular, the organization applauds Congress for the inclusion of Expanded Learning Time in several areas of the legislation—most notably, within the 21st Century Community Learning Centers (21st CCLC) program, the only federal program dedicated solely to delivering after-school, before school, expanded day, and summer services for low-income students. FOR IMMEDIATE RELEASE BOSTON, Mass—December 9, 2015—U.S. Senate passage of the Every Student Succeeds Act, which rewrites No Child Left Behind, provides a new opportunity to improve education in America through greater adoption of expanded learning time in public schools, says Steven M. Rothstein, chief executive of Citizen Schools which partners with public schools to provide academic support and hands-on learning for 5th, 6th, 7th and 8th graders in high-need communities in seven states. The legislation passed the U.S. House of Representatives on December 2, 2015, with strong bipartisan support. President Obama is expected to sign the bill into law before the end of the year. "This is the biggest commitment the federal government has ever made to expanded learning time. This is a historic milestone for underserved students and a strong statement from a bipartisan group of legislators. It will be an important step to reduce the opportunity gap that has grown over the years,” said Rothstein. I wish you could have been with me last week in our nation’s capital. I am so inspired by so many of the students, principals, corporate partners, and others who joined us there. On Monday, we had a special briefing on key education and STEM issues at the White House. On Tuesday, we organized, with the partnership of many other groups and organizations, the first-ever Expanded Learning Summit: Meeting In The Middle. Many joined in person and hundreds more participated in the conversation via live stream or social media. Then on Wednesday, we continued the advocacy and momentum and brought students, educators, corporate partners and our team to Capitol Hill for meetings with 36 Democratic and Republican members in the U.S. Senate and House of Representatives on key education issues. The summit was the first time a group of this scale – including more than 55 distinguished speakers and panelists – has convened to discuss how expanded learning can help close the opportunity gap for our nation’s young people. We had a range of thought leaders and policy makers participate, including our chairman, Dr. Larry Summers; the Mayor of Washington D.C.; Wendy Spencer; the Deputy Mayor of New York; a representative from the George Bush Center, and literally dozens of the “best and the brightest” in our field. We are deeply grateful to all of those who participated in the summit, and to the many supporters and convenors who made this event possible. They are all highlighted on our event website. We are committed to the thousands of children whom we serve, and to growing the field of expanded learning. We believe that last week’s activities were critical in advancing this agenda. As we recognize our 20 years of service, the Expanded Learning Summit highlights how much more there is to do in our next phase. In the coming days, we’ll continue to share opportunities to engage with these important ideas, including archived video from all summit sessions. P.S. We welcome your support to help more students across the country build the skills, access, and beliefs required for them to thrive as students and succeed as adults. Michele Ahouse is the National Director of Citizen Teacher Engagement at Citizen Schools. Policy was never my thing. When I met my now mother-in-law, one of her first questions was how many times I had voted in elections. I smiled politely and nodded, thinking that in the great state of Massachusetts, my vote wasn’t going to swing anything one way or another. Wasn’t my voice just lumped in with everyone else’s? Throughout my time as a volunteer Citizen Teacher for Citizen Schools teaching multiple apprenticeship classes, I took a similar approach to action alerts and policy messages that landed in my inbox. Occasionally, I would click the “Send a message to my Congressman” where I would find a nicely written message. All I needed to do was type my zip code in and bam, it was submitted. Within seconds, an automated “out-of-office” like email would come back from my senator telling me he agreed with my thoughts on “x”-initiative and really appreciated my voice. Sure. Whatever. I believed in the change, but I didn’t think my little voice resonated at all. I was not a phone caller, a picketer or any of those other seemingly attention-grabbing policy wonks. Fast forward five years to my current position here at Citizen Schools as the National Director of Citizen Teacher Engagement. During my first month, I had a call with our Executive Director of Public Policy and Communications to find out more about our policy initiatives as it related to Citizen Teachers. I was dreading the call, because I knew I would have to fess up about my lack of faith in policy. But I also felt like it could be a real learning tool, because frankly, I’m sure I’m not the only one who felt this way. Over the course of the hour, she proceeded to take me through a grassroots Policy 101 session - explaining that despite the impersonal nature of the responses, it was actually someone's (and often multiple staffers') job to count and report back to our representatives on responses they received from emails, phone calls, social media and visits. More importantly, the more responses something got, the more attention a representative gives to the matter because his/her job is to be a representative of the people. And despite whatever concerns we have about the current climate in Washington, when it comes down to it, we elect our representatives and that is our strongest voice. I had the privilege to take part in our annual Hill Day event on March 21 and actually see this all in action. This day is when Citizen Schools representatives - staff, board members, student alumni and Citizen Teachers - from all eight of our states go to Capitol Hill to meet with our representatives. We spoke with a range of politicians- Senators, Representatives, aides and even Minority Leaders Pelosi and McConnell. We talked about the impact of Citizen Schools in their districts, the success our students experienced as a result of the program, the important work AmeriCorps members are doing throughout the community, as well as the potential for the future of education. I even saw staff answering phones and actually writing down tallies for support/dissent on policies. In some meetings, we encountered vigorous head-nodding agreement; in others, it was a learning experience for both sides. For me personally, it was a fantastic experience to be there, having real-time discussions about the impact of sequestration, this abstract but constant buzz word that had surrounded me for the past 2 months. We strategized ways to preserve the funding and support that makes Citizen Schools be able to provide middle school students with the opportunity to realize and achieve their dreams. Most of all, we shared stories and gave a voice to the students who we serve, to the staff and volunteers who help our students achieve success. I walked away from the day feeling empowered and full of promise. I felt like my voice was heard and we achieved something. We are currently working with schedulers for our representatives to get visits on the books for this spring to see our students and apprenticeships in action. I’m eagerly anticipating these, as I know seeing our students, staff and volunteers in action will bring to reality the importance of education support. The cherry on top - March 21 was my mother-in-law’s birthday. When I texted her a quick “Happy Birthday” early that morning and told her what I was doing, she promptly responded back, “You’ve come a long way baby.” Have I ever! Nearly 150 leaders from across Massachusetts gathered at Citizen Schools' headquarters to hear from Kumar Garg of the White House Office of Science and Technology Policy. "The real reason why we're here is that Citizen Schools has been having incredible success," explained Garg. "It's a 15-year effort that has really provided a lot of impact. We wanted to be encouraging in that effort." Garg's visit was part of a gathering aimed at addressing the issue of STEM (science, technology, engineering and math) education. A panel of representatives from the event's co-hosts, Google, EMC and Cubist Pharmaceuticals, added anecdotes and evidence of how corporations can impact STEM education by partnering with organizations like Citizen Schools and getting their employees involved. "It's critically important that young people learn science, technology, engineering and math skills that the private sector demands," said panelist Michael Bonney, President and CEO of Cubist Pharmaceuticals. "This is an opportunity to share and learn about some of the best practices for providing students with the skills and experiences needed to succeed." As part of our efforts to engage more professionals in leading hands-on STEM projects with students, Citizen Schools has convened leaders from businesses, education and nonprofit sectors in cities across the country to find ways to collaborate and provide more STEM education opportunities for students. Events have been held in Boston and Silicon Valley, Newark, and Charlotte. Watch highlights of the event here.